All prices are in Canadian dollars. 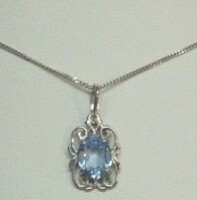 14k white gold pendant with a blue stone. 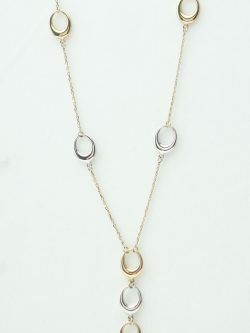 The pendant comes with a 14k 18 inch* white gold chain. This is a beautiful, elegant gift for a woman or a birthday gift for a child. Length of Pendant: 19mm* Width of Pendant: 10mm* *all measurements are approximations. All prices are in Canadian dollars. 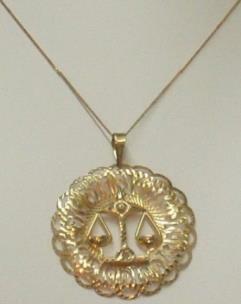 10k yellow gold Libra zodiac charm with a 16 inch* 10k yellow gold chain. Diameter of Charm: 39mm* Total Length of Charm: 46mm* *all measurements are approximations. All prices are in Canadian dollars. 10k 18 inch* yellow and white gold chain from Italy. Length: 18 inches* long + 34mm* long drop. Width: the widest point is 8mm* wide. *all measurements are approximations.